On the same day that the Wall-boxes miniature sheet and Smilers sheet appear, Royal Mail is issuing a prestige stamp book with illustrations and narrative about the artifacts and philately in the British Postal Museum and Archive, successor to the National Postal Museum. 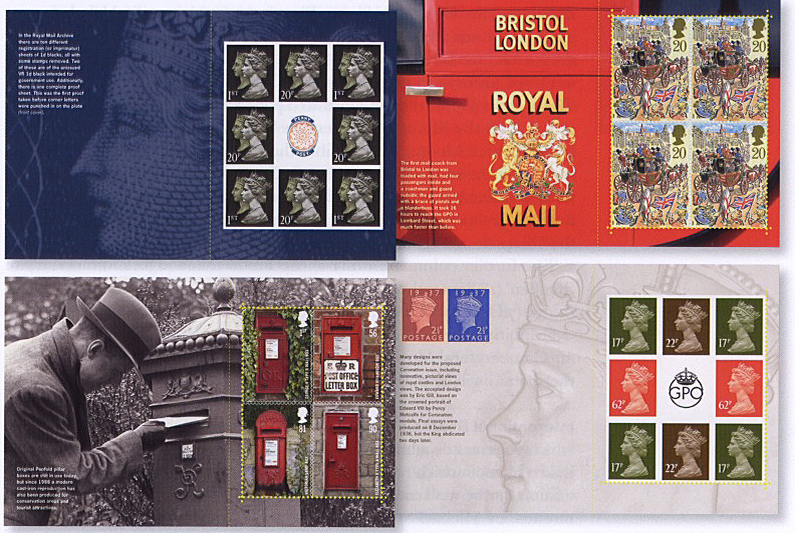 This book contains no fewer than 6 - and possibly 10 - new stamps, some of them new versions of stamps issued 20 years ago! Pane 1 has four 1st and four 20p Definitives, both stamps bearing the double image of Queen Elizabeth and Queen Victoria from the 150th anniversary of the Penny Black stamps, set around a Penny Post label first issued in 1990, with the Penny Black portrait of Queen Victoria in the background. Pane 2 has four 20p stamps featuring the Royal Mail Coach from the 1989 Lord Mayor's Show issue, showing the door of the Bristol - London Mailcoach in the backgound. Pane 3 has all four of the Post Boxes stamps in a block of 4, rather than a strip. The background shows a Penfold hexagonal Victorian pillar box. Pane 4 has four 17p Machin Definitives, two 22p Machins and two 62p Machins around a GPO logo label, the background showing images of the proposed 1937 coronation issue for King Edward VIII. The book is printed by Walsall Security Print in litho. Doubtless somebody more expert will remind me if any of these are not new stamps because of that! The earlier 20p's printed by Walsall in litho were on phosphor coated paper (ACP) and did not have elliptical perforations. If these stamps have either phosphor bands or ellipticals, they are new. The earlier first-class NVI's printed by Walsall in the 2000 Special by Design prestige booklet were printed by gravure, so these litho versions are definely new. With regards to Larry's comment on the 20p double head stamps. The 1990 issue printed by Walsall in litho from the £1.00 vending book was on ACP paper as he states. However, this paper has not been used for some time now so they should be new regardless of the phosphor bands or ellipital perfs. Sorry but a spelling mistake got in. The correct spelling is 'elliptical'.